When you think about royal style, the first ones that come to your mind are probably Duchess Kate, Duchess Meghan, or even Princess Diana. However, the Queen has also proved to have a flawless sense of fashion, starting with her sleek monochrome outfits and finishing with her matching accessories. But we aren't talking about fascinators or jewelry, which Queen Elizabeth II certainly has in excess. In fact, there are some other supplements for her fashionable ensembles. Did you know that the Sovereign has a fascinating collection of umbrellas and handbags? When looked over thoroughly, they are subtle accessories that raise a few questions: Who designs them? How many does the monarch have? The answers for these and many more questions are all in this article, so check it out! 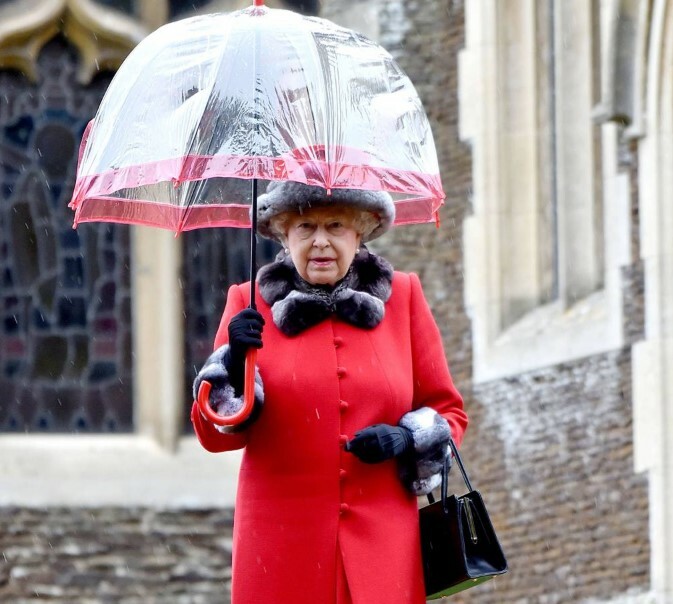 To achieve a high level of monochrome excellence in her outfits, the Queen recently found another way of combining her coats, hats, and dresses, and that is by sporting umbrellas. For the last 15 years, we have seen her with parasols that achieve tonal continuity with everything else she wears. The creator of every masterpiece is Fulton, the UK's largest supplier of rainwear and umbrellas. According to the company's website, they are specialists when it comes to this accessory that is so much needed with the inclement British weather. Established in 1956, quality is a cornerstone of the business' success, using prime materials and exacting engineering standards. 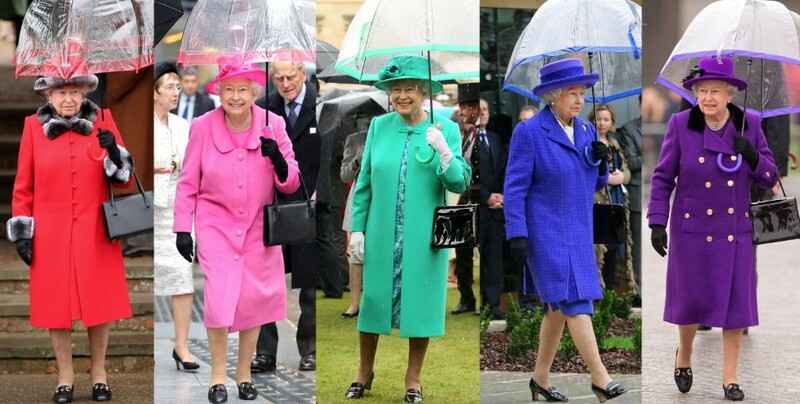 In 2003, Fulton began to receive orders from the Queen to tailor the rainy accessory to her liking, which included customizing the color to match her outfits. As explained by Town & Country, the correct shade was one of the essential features of the finished product. It is no surprise that she has a rainbow of options since she's been ordering sunshades since 2003. So how does the Queen let Fulton know what she wants? The source also explained the manufacturing process of these beautiful umbrellas. The royal household custom orders each parasol in advance, communicating the desired tone frequently through a fabric sample. Following the request, Fulton makes prototypes that need to be approved before the umbrella is manufactured within the royal terms. Apart from the color, another specification the Queen requires is to make the colored strip near the rim thinner than in the regular models. Now, among all the companies the Sovereign could have decided from, why did she go for that specific British manufacturer? It turns out it all comes down to family history. 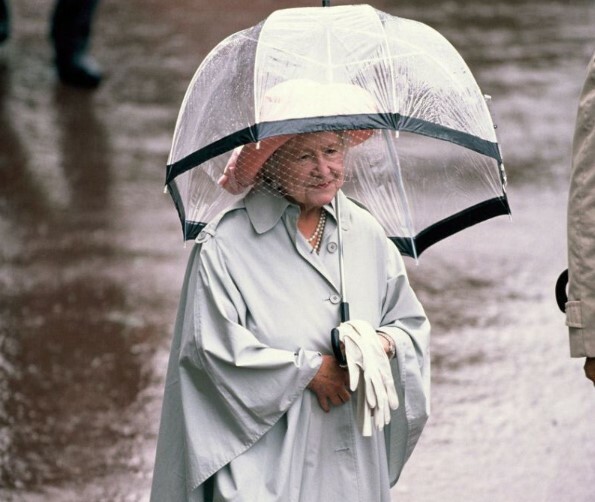 The Queen Mother was the first one to sport a Fulton rainy ware back in 1988. 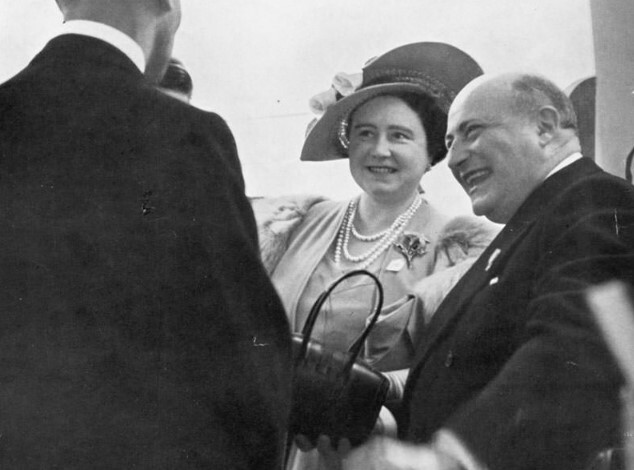 In that year, the Queen Mother's secretary phoned the company looking for a clear umbrella dubbed the "Birdcage," one of the brand's pioneers. The style was not being produced anymore due to a slowdown in sales, but once Fulton received that call from the Palace, it did not hesitate to put the design back into production. The company was prompt to accommodate the royal request, and that was how the Queen Mother was first spotted with a Birdcage umbrella, which ultimately led her to issue a Royal Warrant. In 2008, Elizabeth II did the same to give continuity to the family history with Fulton. 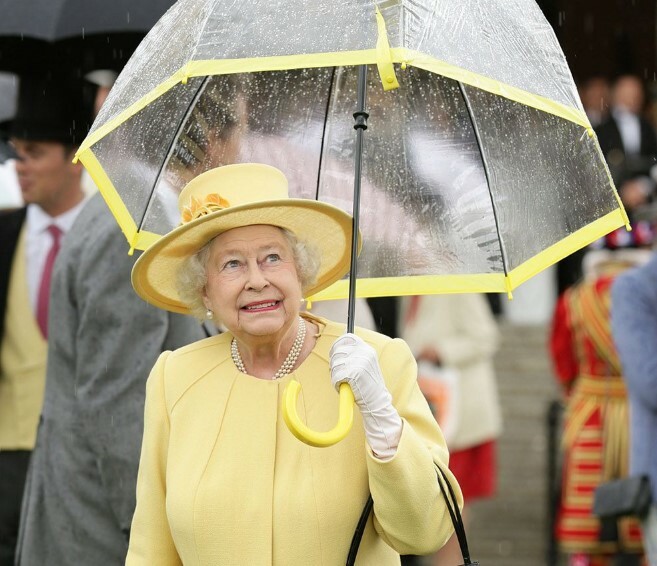 However, prior to the Queen's Royal Warrant, she procured some of the designs by asking her staff to go and buy them at a store until she determined to grant the rainwear manufacturer with the official authorization to be her supplier of sunshades. According to the company's website, "On 25th March 2009, Fulton was honored to welcome HM The Queen and HRH The Duke of Edinburgh to its premises in East London during an official State visit, where we demonstrated some of our fashion design, manufacturing processes, and the latest technical developments." 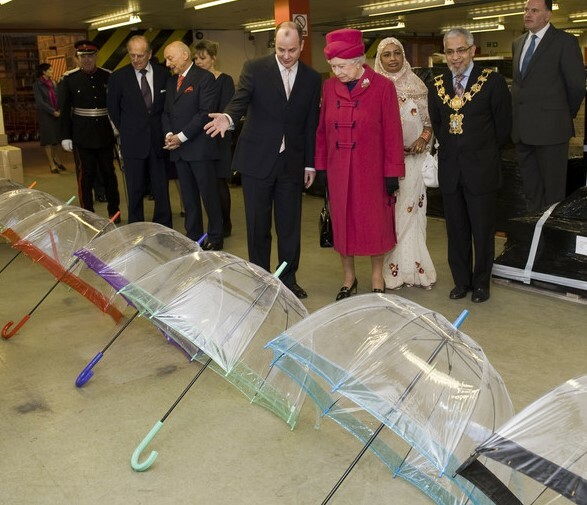 "It was a very surreal experience to be walking next to the Queen, talking about umbrellas. It was like a dream almost... Everyone in our company will remember forever, obviously." 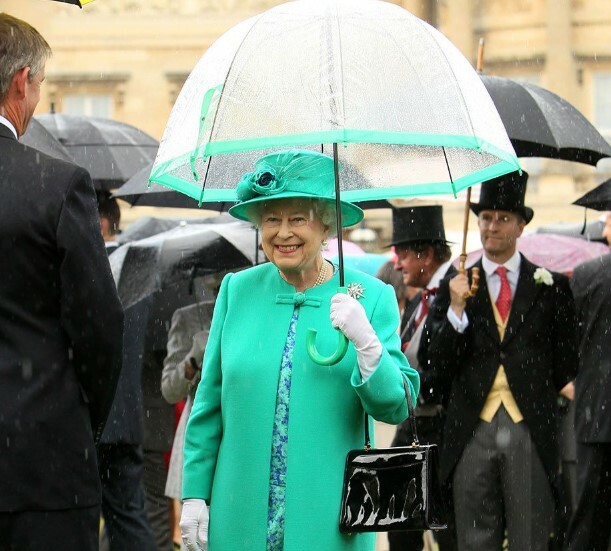 Now that we know everything about the Queen's umbrellas, let's move on to another essential accessory for her: her handbag. And pretty much like with her chic rain protections, she also has her own royal supplier: Launer. With more than 70 years of heritage, the British company creates luxurious, fine handbags and small goods, as stated on its website. 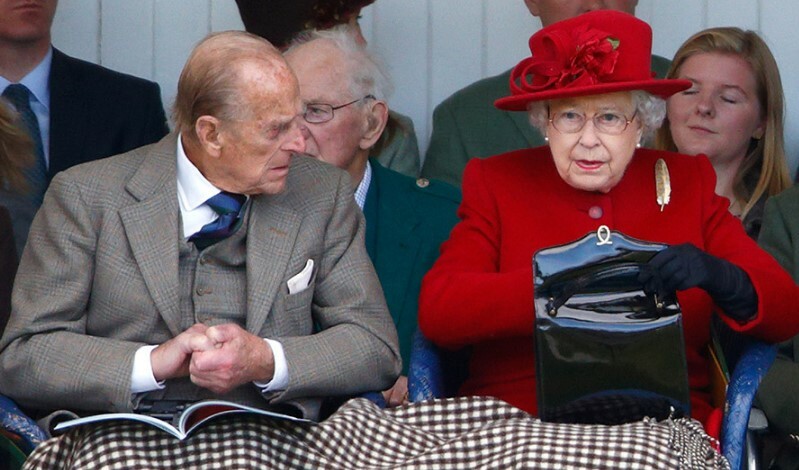 According to the Telegraph, Elizabeth II has more than 200 bags from the brand. 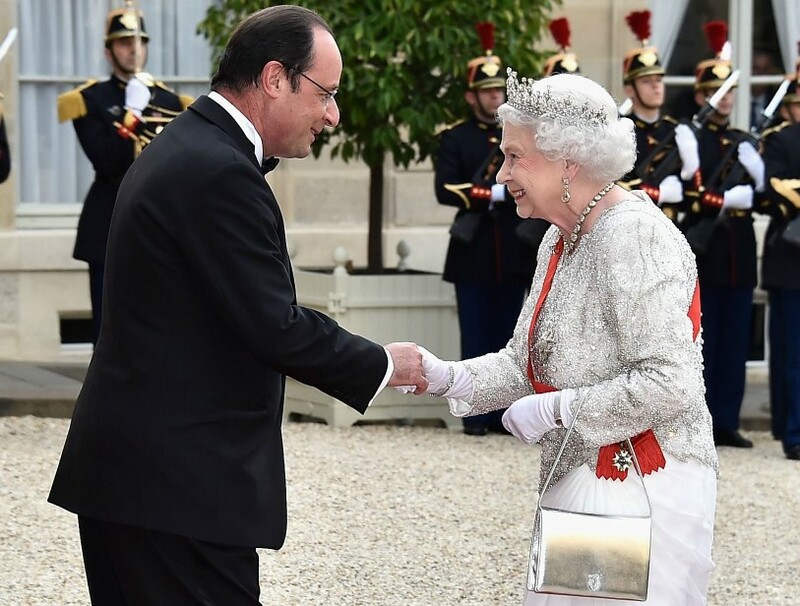 And this isn't unexpected at all since the Queen has been requesting around five of these accessories since 1968. In that year, she awarded the supplier a Royal Warrant. 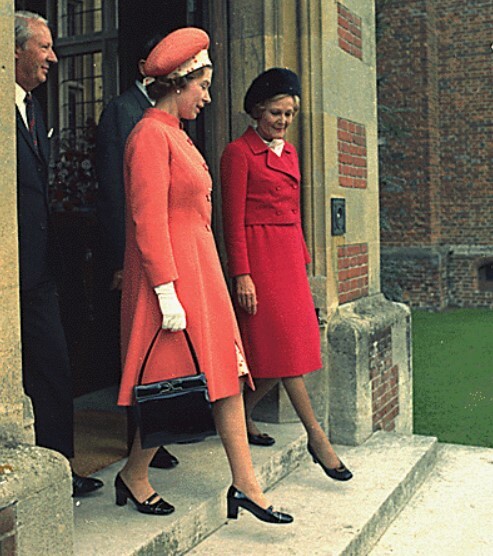 Before 1968, she acquired some Launer's handbags through Rayner, a shoe label with a Royal Warrant as well. 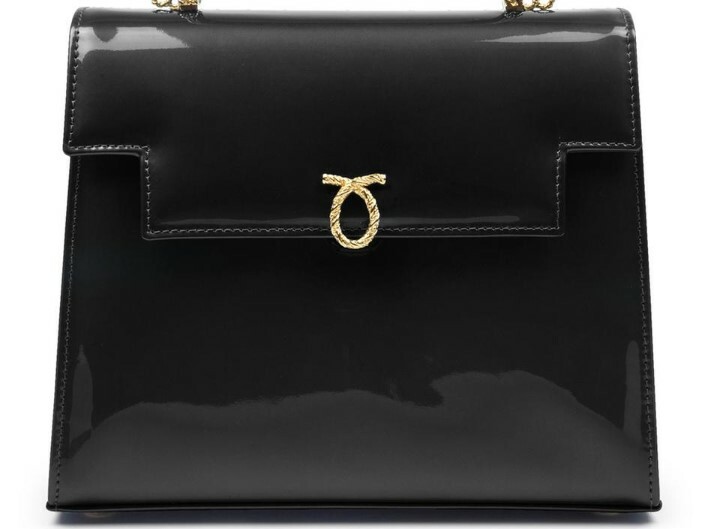 Although the monarch has an extensive Launer collection, there is no doubt she has three avowed favorites: the black patent Traviata, the black leather Royale, and a custom handbag. Let us begin with Traviata, the design Elizabeth II has been using the most lately, according to what the company's owner Gerald Bodmer told Hello! Magazine. This handbag with a simple shape and short handles has Launer's silver twisted rope logo on the front. It looks similar to the Royale but has squared edges near its clasp. It comes as no surprise that Traviata is one of the company's best-selling designs. After all, it has the Queen's endorsement, right? Then, we get to the Royale, one of Launer's enduring styles that Elizabeth II likes in patent leather. And finally, we have the unnamed customized bag that the Sovereign acquired through Rayner. She used it to meet USA presidents Nixon and Clinton and then immortalized it in one of her official portraits. Undoubtedly, it is one of her all-time picks. Hello! Magazine also stated that all the carryalls are bespoke, made of soft calf leather, and lined with a lightweight full-grain suede. Daily Mail added some other details explaining the modifications the Queen has requested to the iconic styles. For instance, she likes longer handles to avoid getting caught up in her clothes when greeting. Moreover, the Queen doesn't like zips, partitions, or shoulder straps but does fancy a frame in the middle of her bags that could allow her to reach deep inside easily. MORE FAMILY HISTORY? OH YEAH! Similar to Fulton, the beginnings with Launer date to the 50s when the Queen Mother purchased one of the brand's handbags. Subsequently, she gave one to Elizabeth II as a present, and since then, the monarch has been a strong Launer devotee. Town & Country stated that the ruler even keeps her mom's carryalls. 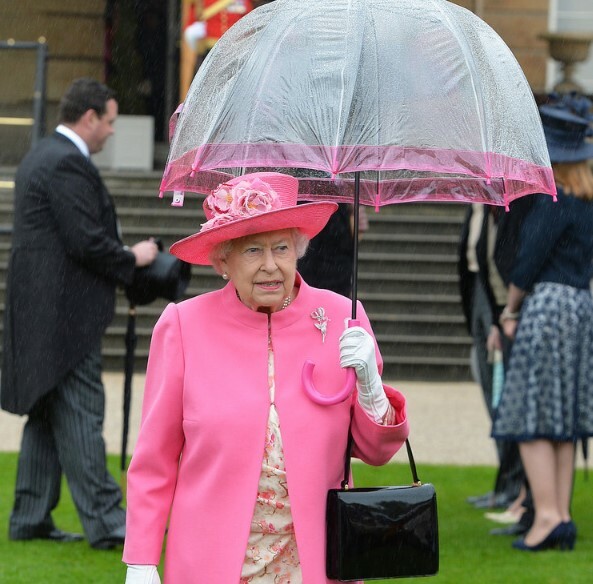 Little did we know that there were so many intriguing facts about Queen Elizabeth II's umbrellas and handbags. Were you aware of all that? Tell us in the comment section down below, but don't go too far because we have more captivating articles about the British monarchy for you. Check them out as well! Meghan Markle, the Duchess of Sussex, has adapted well to royal life. Her relationship with Queen Elizabeth II has prospered, and through this article, we'll talk a little about the friendship between them and her possible inheritance.